This Category 7 cable is shielded to resist electromagnetic interference. The #26 AWG copper conductors are twisted in pairs. 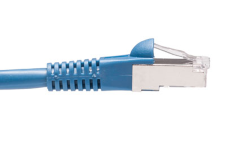 Its RJ-45 connector has molded boots for protection during installation.